Straw green color. Fruity, floral aromas and flavors of spiced apples and oranges and lilacs and peony with a supple, crisp, fruity light body and an even, brisk finish evoking notes of lemon sorbet and nectarine and green apple with fine, crunchy, fruit tannins. A nice light, floral, fruity sipper. Bottom Line: A nice light, floral, fruity sipper. 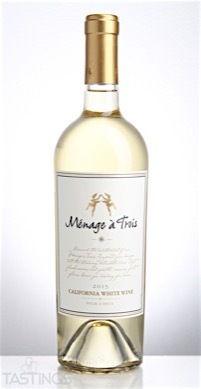 Ménage à Trois 2015 White Blend, California rating was calculated by tastings.com to be 87 points out of 100 on 4/10/2017. Please note that MSRP may have changed since the date of our review.